Louis Hock is a filmmaker, video installation, public and visual artist, and a professor at UC San Diego. His project addresses the cultural clashes and exchanges taking place on both sides of the U.S. and Mexico borders. His award-winning video documentary series The Mexican Tapes: A Chronicle of Life Outside the Law (1986) are complemented by Sketches From the American Tapes (2009) in which Hock revisits the stories of three families he recorded 25 years earlier. 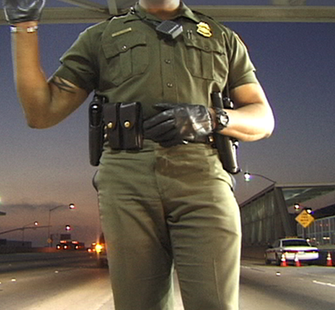 FERAL (2004), a large-scale video and sound installation depicting the border patrol's intimidating, random process of selecting those attempting to cross the U.S./Mexico border. Ariel Swartley, AGENCY's resident writer, offers insight on Louis Hock's installation. Read it here.